A pros and cons list of the various methods and types of food for deep pantry storage that you may consider in your overall diversified preparedness plan. Best way to dry meat items. Generally tastes better than dehydrated. Individual meal choices ideal for backpack. Retains original shape, texture, color after reconstitution. Most expensive food storage option. Most items require water to prepare. Items are bulkier than if dehydrated. If purchased in Mylar pouches, susceptible to puncture. Low moisture (not as dry as freeze dried). Lightweight (not as light as freeze dried). Long shelf life (not as long as freeze dried). You can do it yourself with a home dehydrator. Some items have poor visual appeal. May lose some taste after reconstitution. Some items take a long time to reconstitute. Requires no water to prepare. No mixing or blending required. Simple to add in a backpack, kit. Can be heated for hot meal by many methods. MRE’s taste better these days than they used to. Can be eaten right from pouch without preparation. Not intended for long term consumption. Taste of MREs considered less than ideal by some. Lots of sodium (needed for long term viability). Artificial additives added in many recipes. Expensive considering actual food received. Entrees alone will not supply adequate nutritional value. Because of foil pouch, they are susceptible to puncture. Can be heavy if larger quantities need to be transported. Wide variety of canned foods. Readily available at all grocery stores. Moderate shelf life, generally 3-years – depending. ‘Real’ shelf life often much longer than posted without issues. May have lots of sodium (for shelf life). Typically lots of preservatives, other additives. Not as practical for on-the-go or carrying. Exposure to water and humidity promotes rust. Something you can do yourself. Tremendous options of what you may ‘can’. Excellent method towards self sufficiency. Initial cost of jars, lids. Good for portability – small kit, quick calories. Not everyone likes the taste. Not a satisfying substitute for a hot meal. Good nutritional value with variety. The basic food staples – very important. Very long storage life if stored properly. Essential ingredients for sustaining life. Many sprout-able seeds, grains, and beans increase nutritional value. More time consuming to prepare. Heavy weight – meant for storage, not portability. Not generally appropriate for shorter term emergencies. Time is required to adapt to basic commodity oriented diet. Requires relatively large quantities of water and fuel to prepare. There is more to this… Within each category there are some food items that offer more “pros” then the others in their group. For example rice. White rice is easy to prepare, can be combined with almost anything to make a delicious meal and is cheap, easy to store and has a great weight to calorie ratio. Powdered or flaked potatoes have a similar list of advantages. 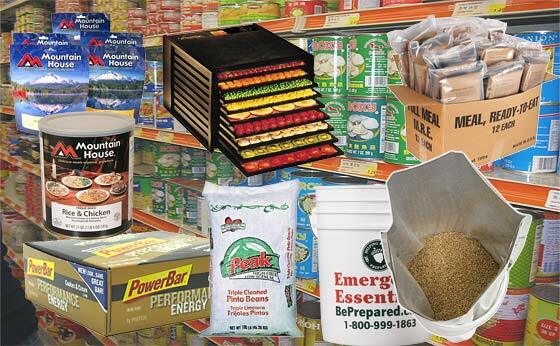 Variety and diversification are important for a good overall food storage plan. The partial list above should give you some ideas to consider. You might check out what Bob has over at ReadyMadeResources. Not only does he carry a wide variety of supplies, but food kits too. Here’s his Emergency Storage Foods page. Excellent breakdown and solid reasons to have all the above. I’m odd in that after years and years of military and foraging, growing up poor I eat for fuel and taste and such is secondary. The guys n gals at work get me tickled at things like “oh I can’t eat that because of the texture”. Money is generally tight or non existant, so i do what i can with what i got, so canning, dehydrating, because i can do both fairly economically. Not that i wouldn’t love to have a big stash of freeze dried goodies, but it has just never been a priority. Commercially canned foods are a main stay in my “long term” stash, just because canned SPAM and corned beef are good sources of proteins and fats. Buckets of grains is next in line, and actually the largest group in my storage, it will last forever so figure its worth adding to every couple years. IMHO being able to cook up some rustic biscuits or loaf of bread will be huge if anything does interrupt the status quo, or even tortillas, i can grow veggies, i can shoot a deer, but grains are almost impossible to grow here. Just too humid, and without netting the birds get it all before its ready. What type deer do you have on the island? Whitetail, fallow, native? Are they pretty plentiful? Just curious, not planning a hunting trip. Many of us like to store white rice. It’s low cost and has lots of calories. I keep parboiled rice or as some say, converted. Why? Because plain white rice is mostly just starch and lacking many nutrients. One particular nutrient it lacks is Thiamin, aka vitamin B1. The lack of vitamin B1 causes a nasty disease called Beriberi. A serious condition if the heart and nervous system. Eating meat, vegetables and fish can provide the vitamin B1, but in the long run, who knows about future availability. Prefer ingredients to pre-prepared foods; and stack it and forget it for my LTS. JIC a quick meal is needed do have a few buckets of Auguson meals that were half-price at Walmart a while back, and a few boxes of Mountain House meals bought when on sale at Costco. Food bars are kept in vehicles. Have stocked up on grains, potato flakes, and instant milk, mostly in #10 cans and pouches from LDS store. Wrists just don’t like moving heavy buckets anymore. Big bags of beans in the freezer waiting to be broken down into smaller vacuum-sealed bags. Have a few #10 cans of FD meat and peanut butter, and dehydrated fruit and veg. Wish I could afford more, and a freeze drier of my own is at the very bottom of my list. Oils are in the freezer and big bags of salt and sugar in metal garbage cans. Like Tommyboy have focused LTS on what I would not be able to harvest from my own land and nearby. Thanks Ken, good article. Lots of choices in food storage. A home freeze dry unit is over budget for us so we do a lot of home canning. We can from our garden: carrots ,beans, squash, beets,peaches,plums, etc. We also can chicken,turkey,beef and pork. We really like turkey , a very low price food item. We have a Nesco dehydrator and do potatoes,peppers,plums, apples, onions and carrots. We do freeze some items , but look at freezing as a short term, temporary storage solution because of a possible power failure situation. Store bought canned foods make up a large part of our storage inventory. Of course having the space to put all the stuff is a concern.If you have a small house/apartment it can be a very challenging experience, but an opportunity to get creative . I don’t can pork but do can a lot of ham. I usually buy a couple around xmas time and that will last well over a year. IMHO ham is a must with beans,pea soup ect. 1 pint will flavor a couple of pounds of beans or split peas,add a little garlic,onion,salt and pepper and I have a meal that will feed 2 people for a couple of days. Add cornbread and it just went to 3.
poorman….like to add small cubes or shreds of carrots and potatoes to these types of meals. Like the taste, and if needed, it too can stretch the number fed. Also, add some powdered mustard. Like the kick of that in it too. Poorman— have come to love powdered mustard. Theoretically it should be same as mustard in a bottle, but it seems quite different taste in cooking. Use it in a fair bit, and love it in those soups. Hi All, I have read most of the comments, Much of what we prefer is what will drive us. I am opposite of some I can mostly pork… year round as it is available and $$ is available. i rotate it out. and i keep a few packages in the freezer.I prefer beef fresh/frozen as well, but dehydrated/oxy free glass jars is how I store the long term supply- which is limited.I have some beef jerky. Meats are our exsitence due to prescribed diet/health issues. In an emergency neither of us desire to be ill so are trying to plan for sustainable in the long run. My days of eating Venison and other wild meats are gone. The brain wasting disease is in our area( within 10 miles) and it is transmissible to other animals… via all bodily fluids..from breeding and grazing in an area where an infected animal has been…time of viable transmission limits is unknown, is thought the protein is transmissible for many decades.unless it is buried deep. ..TOO many unknowns… . It is a matter of time. before more cases turn up in the human populations.UNLESS a treatment is developed for it and an early test to determine if one has gotten the protein. Our plan is to add rabbits, and possibly turkeys this fall as we get infrastructure. Having the ability to feed each set of animals is a major concern..with only an estimated <3 acre grow. and part of that is too wet to plow…and desire is for that grow area /green house, hoophouse that will give us corn and squash in january and root crops in succession well past the first frosts. Carrots, beets, radishes, some turnips… greens only for the animals , it is our best way to consume those. While not as cold as Alaska , humidity, moisture and other concerns will dictate where our structure is located.. .interested to know about grow lights necessary – cost and life expectancy. and heating concerns. Our lowest temps were in the teens for a few days here., and there are green houses in all kinds of places, to find the one that we can afford to heat/light for optimal plant growth is our challenge.. Dehydrator.? yes!. want to do a solar one for summer. to augment the electric one we use now…Goal is lots of summer squash, zucchini, okra, roasted pepper, sweet peas,and string beans fresh from our own garden and secure in the smallest space possible. Dehydration does that. One pint of Okra = 4 meals. Corn dehydrated 1 qt packed is 30 ADA servings. Ground beef packed into 28 oz peanut butter jar…about 5 meals.for 2. ( roughly fresh/ 3.5 lbs.) Beef into jerky strips.? can't remember haven't done lately but one quart jar will make a boatload of spiced soup. with qt.dehydrated mixed veggies… Mushrooms and onion are also on that want list. but do not see mushrooms this year from our own. Onions… will see. Garlic we have. love the tops to make garlic sauce for veggies during winter. a couple pints sauce is plenty..
Like others posting rice is the one thing i try to keep on my shopping list. I store n buckets and oxy free packing as well as in 2 liter soda and gallon juice jugs.. packed with oxygen absorbers added. Plain white rice. i also believe will be seeing a price increase on all staple foods soon. There is simply too many areas facing crop and storage loss…the world over. The additives for that rice.need to be also stored separately in their own oxy free packing. One of my tricks is to pack a qt of sugar, a pint of salt, ( each just dry sealed in glass jar. )and 1 – 2 oz of cinnamon/nutmeg/allspice W/2- 2oz of Vanilla in a separate container down in the rice bucket. add eggs and i have a custard , can still make something besides plain rice even without another ingredient handy. I have begun to collect recipes for rice- that we prefer….I pack other spices in other locations. Bay leaves with dry beans, and other spices /cooking needs in a sealed jar within that bucket.
. If you have not cooked Rice. be sure to bone up on your preferred way to prepare it now.. I know many stock brown rice, .. shelf life , is really short comparatively and some will not eat the converted/parboiled stuff. What ever they do to it changes the flavor..(I have a supertaster who will not eat it.) SO be sure your family likes a food item before you buy in quanity…NO MAtter who recommends it. Just Sayin’, the rabbits are a good idea but I would not recommend the turkey. They are a pain…they eat too much, they are sweet but stupid about everything, the breeding pair need to be kept apart or the male will maul the female, but then you need more than one of each for companionship in their separate pens….and they poop up s storm! I love eating turkey, but is easier to grow out poults each year and then harvest them all than keeping breeding birds. We have done both but I do not recommend it. And I just reiterated this fact to my darling spouse. I would recommend ducks in place of turkey. They are better foragers, eat less feed that I have to provide, lay an egg every day once they start in March and continue until October, they are fairly quiet and get along well with other farm animals. I especially like the Ancona ducks, which we raise. My ducks come in to the lockup enclosure each night on their own with the chickens. Plus you have a reasonable amount of meat to eat when you harvest one. Eat all but one of the boys, keep the girls for layers. Just my opinion but thought I would pass the info along as we have been through it. On turkeys.Thinking we will grow out every other year., several ….on the turkeys.. .possibly… and cook and can results. Poop is good fertilizer..can use it composted or as tea in fertilizer mix. Have someone local who has breeding pairs…may have to get the info and obtain some from her…already a couple weeks old…. Hubby does not want ducks.too much noise./ I don’t know anything about them, he has had them before as a young teen he had to maintain. ..He does not like duck eggs,he can tell them apart. .. think he likes their meat. if we can find some that are quiet…might try them. talked about guinea pigs (and guinea hogs- which would take a long time to feed out..)… guinea pigs have poor temperature tolerance.about the size of a rabbit.., requiring controlled enviroment…could gather grass year round to feed them. (make hay during summer and have enough to over winter them.. next choice would be pigs. and they will be growers… again sustainability. we do not have very many scraps..another possibility is a feeder goat…might need to move it to another location part time. would be posssible.and would clean up the brush..rose bushes and sweetgum sprouts. even will eat kudzu. I believe that having all your eggs in one basket is not a good idea. Keeping a combination of these different types of food storage protects you in the long run. Eating fresh is always healthier but the FD and dehydrated will come in handy if the crops are destroyed or cannot be planted. Having canned goods, including home canned, for eating quickly and quietly is also a benefit. The freezer and frig could also fail. Back up your backups. I see the Good, Bad, & Ugly of just about all ways of preserving foods, and Yes I do us practically all methods except FD-ing my own, but I do purchase quite a bit, mainly when on-sale. I do hear a lot of “well this don’t taste as good as that”, Wellllll if were talking SHTF/EOTWAWKI guess what, that 8 year old can of Lima Bean soup is going to taste mighty good. And if it’s a little low on Protein are ya going to turn it down? I would bet not. BUT if you’re talking a properly maintained Deep Pantry, “Store what you eat, Eat what you store” than you’re going to be fairly well set; BUT don’t forget those MREs and a few dozen cases of DF Tacos, again, when the Deep Pantry gets really low, that ‘gunk’ is going to be mighty welcome. PSS; Food management is one of the most challenging aspect of living the Lifestyle, and maintaining a balance throughout the years. Methods of storing as the article above, is a HUGE factor in that management. PSSS; Don’t forget the Beer. is a GREAT source of nutrition. Honestly.